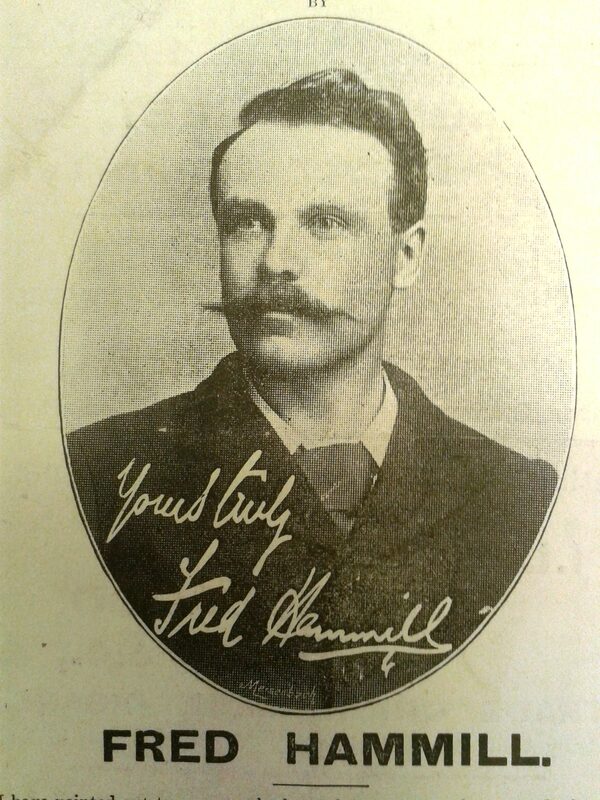 Frederick Parkin Hammill was always called Fred. Fred was my third-great uncle and he was unrecognised as a politician until recently. He was born on 4 May 1856, trained as an engineer, and married Ada Peel in Leeds. They had three children (Arthur, Helen, Gertrude) and moved to London for his work at Woolwich arsenal, where he was a well-known labour activist and trade unionist. He was reportedly sacked twice for being an agitator. Fred gave defence evidence at the trial following the 1887 Trafalgar Square Riots. He was active on the Fabian Society executive committee, the London Trades Council and in the TUC, and he would speak indoors and outdoors to crowds of up to 6,000 people. In 1891 Fred organised the London strike of bus and tram workers and he was one of the founders of the Independent Labour Party. In 1893 he spoke at a demonstration and rally in Trafalgar Square on workers’ rights. In 1895 he was the first socialist to stand in Newcastle in an election to Parliament. He didn’t win, and being unemployed and marked down as an agitator, he changed tack to run a pub in North Yorkshire, for which he was criticised politically. He became involved in local government, elected to the district and parish councils. He died on 8 July 1901 from influenza, aged 45 years. These details about Fred Hammill have been assembled as part of my interest in researching our family history for the stories of people’s lives. Of all the 28 people who were ILP candidates in the UK General Election in 1895, Fred was the last person to have a page in Wikipedia.